Listen to an interview about RST on the @behavioralobservations podcast with Matt Cicoria! This approach is an interactive, caretaker training package designed from evidence-based models including Behavior Skills Training (BST), Shaping, Differential Reinforcement (DR), Non-Contingent Reinforcement (NCR), Direct Instruction (DI), Precision Teaching (PT), Precursor Intervention, Extinction and Parent Management Training. What is RAPID Skills Training? Ultimately, RST provides you with much-needed relief. *** We do not recommend implementing this RST program or any behavior program without professional consultation from a qualified licensed behavior health professional. The RAPID Skills Training (RST) exercise guides are located in the links above and, require coaching, feedback, practice and oversight from a qualified behavioral health professional. Who Benefits from RAPID Skills Training? RAPID skills are critical interaction skills that every caretaker must master. Initially frequent daily practice is combined with professional coaching from a qualified professional. In order to create meaningful daily interactions, these critical skills must be learned… before any advanced behavioral programming is considered. Anyone responsible for daily interactions and activities of a loved one with difficult to manage behavioral challenges can learn critical interaction skills. Providing a doable lifestyle change for improving happiness in life. This approach will create the foundation for teaching students, loved ones, and participants’, functional life skills that are needed to live happier and more independently, with dignity. Simply hearing more words early in life is linked to higher IQ scores, attending and rewarding interactions affect the brain of the learner in positive ways from birth through full development, recovery and/or learning at any age. When caretakers become teachers during naturally occurring activities, learners are more successful, happy and the family experiences a better quality of life together making each day more enjoyable and fun! Dr. Hanley is a premier researcher and practitioner within the field of Applied Behavior Analysis (ABA), specializing in functional analyses of severe behavior disorders. Although a diagnosis of autism is not dependent on problem behaviors known colloquially as “meltdowns, self-injury, or aggression” odds are that one or more of these types of problems requires intervention. Behavioral intervention is effective when addressing tangible behavior problems. It’s more effective when based on a proper functional analysis or assessment. A number of myths regarding functional assessment processes, which appears to be pervasive within different research and practice communities, are reviewed in context of an attempt to develop new regarding the functional assessment process. Frequently described obstacles to implementing a critical aspect of the functional assessment process, the functional analysis, will be reviewed in the context of new solutions for overcoming them. *** Disclaimer: We do not recommend implementing the RST program for any behavior program without professional consultation from a qualified licensed behavior-health professional. RST guides are located in the links above, per skill, for a generic outline of how-to-design-your-own-session a (do it yourself) version of directions for learning yet, it should not be used without professional oversight and consultation. Use at your own risk and do not use in the absence of appropriate professional guidance. RST uses an evidence-based model of teaching called behavior skills training (bst) for anyone learning to interact better and/or care for loved ones who are experiencing behavioral disruption(s). RST has absolutely nothing to do with Rapid Prompting Method (RPM) which is scientifically debunked pseudoscience (click anywhere on the word RPM to see more about debunking RPM & Facilitated Communication). 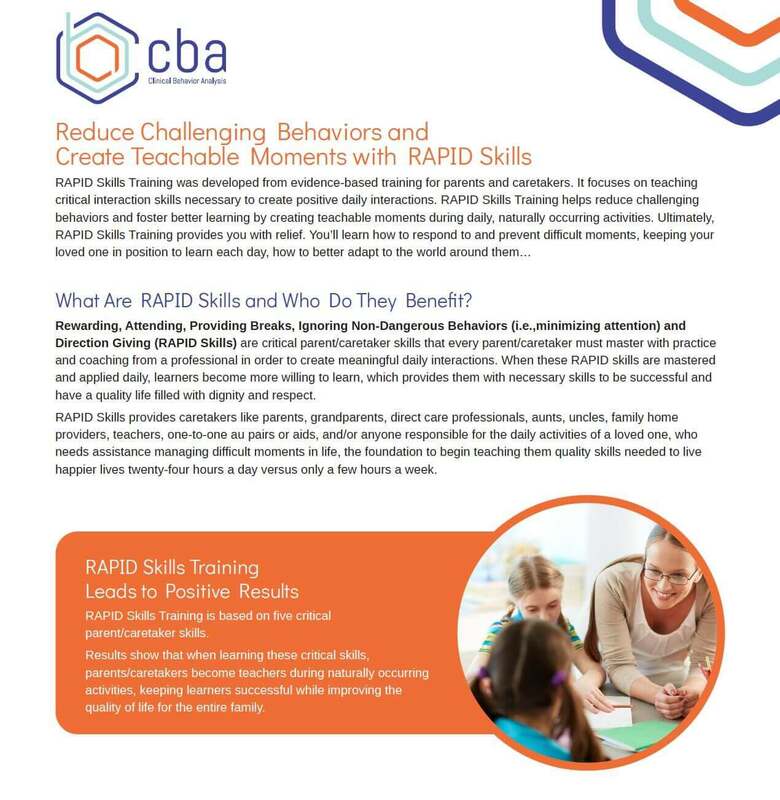 RAPID Training (RST) is federally trademarked in The United States of America (USA) as a parent, caretaker, direct support staff, certified teacher & first-responder training program based on principles consistent with “Applied Behavior Analysis” (ABA), “The Power of Positive Parenting” and “Parenting the Strong-Willed Child“. It is absolutely not and far from the debunked “rapid prompting method”, which is a version of the long debunked “facilitated communication (FC)“. Dr. Matt Brodhead explains why FC is pseudoscience and why ABA is the golden standard for training skills. Interested to learn about a potential REWARDING CAREER? Search the site @CBA for more info! “Request Service Form” we’ll get back to you ASAP!